Nice where is this built? Lol. 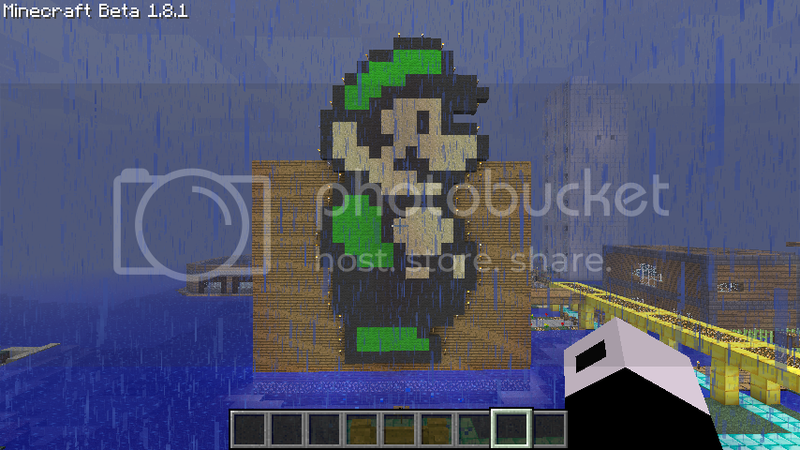 Good Luigi build dude, still got revenge I guess. I'm building a statue of Jo0n, helping build a palace for SpaceBuilder96, upgrading my house, and am gonna make a mini-spleef for New Scandinavia. Is the place finished yet? Hopefully we can continue adding rooms and stuff like that. at this point theres still a lot of stuff that needs building on it. 1. floor is not done yet. nothing on 2, floor and where talking with jo0ni to add some towers or some other cool stuff to it. Sorry for the way the wool looks, had a different TP than normal. Still its a great statue! Heres the link to my town's spleef. Everything looks the same from all sides basically. Uhm its the same everywhere. I'm building an Adventure for the server. the whole adventure is going to be at a temple in the desert. I'm going to add secret doors and lots of nice stuff. secrets of the top temple out. But to build all of that, i need a good story line for it. And could be awesome if you guys could help me with that. Hmmmm good story line. Just take something from a zelda temple!